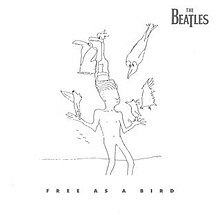 (1995) "Free as a Bird"
"Free as a Bird" is a song originally composed and recorded in 1977 as a home demo by John Lennon. In 1995 a studio version of the recording, incorporating contributions from Paul McCartney, George Harrison and Ringo Starr, was released as a single by the Beatles, 25 years after their break-up. The single was released as part of the promotion for The Beatles Anthology video documentary and the band's Anthology 1 compilation album. For the Anthology project, McCartney asked Lennon's widow Yoko Ono for unreleased material by Lennon to which the three remaining ex-Beatles could contribute. "Free as a Bird" was one of two such songs (along with "Real Love") for which McCartney, Harrison, and Starr contributed additional instrumentation, vocals, and arrangements. Jeff Lynne of Electric Light Orchestra, who had worked with Harrison on Harrison's album Cloud Nine and as part of the Traveling Wilburys, was asked to co-produce the record. The music video for "Free as a Bird" was produced by Vincent Joliet and directed by Joe Pytka; from the point of view of a bird in flight, it depicts many references to Beatles songs, such as "Strawberry Fields Forever," "Penny Lane", "Paperback Writer", "A Day in the Life", "Eleanor Rigby" and "Helter Skelter". "Free as a Bird" won the 1997 Grammy Award for Best Pop Performance by a Duo or Group with Vocal and was The Beatles' 34th Top 10 single in the United States. The song secured the group at least one Top 40 hit in four different decades (1960s, 1970s, 1980s and 1990s). There is a span of 25 years between the Beatles' break-up and the song's charting. SANJAY, I CAN BE FOUND AT PERCY VILLAGE IN BOYLE HEIGHTS CIRCA MARCH 2015 CAN REACH ME UNDER NAME GARYPOWELL. MORE INFO WHEN WE TALK. lOVE YOU! PS. THE TELEVISIN SHOW "BIG BANG' IS ABOUT OUR FUTURE BEFGOE WE WENT ONTHE SUBMARINE. JACOB JENSEN VICEROY OF THE TRADE FEDERATION. jOHN TOLD sTU IN aRT sCHOOL THAT ALL THE CHICKS, 'ALL THE GIRS WERE BIRDS, MAN! WERE BIRDS. I LATER SPOKE TO SIR GORDNG SUMNER AND HE SAID, "IF ALL THE GIRLS ARE BIRDS LIKE YOU HEARD, THNE WHEN YOU LET THEM GO AND THEY COME BACK TO YOU, THERE YOURS TO BEGIN WITH." nICE AYE? What happened in the mean time? One question haunts me all the time, What happened in the mean time? We used to swing to same harmony, We were notes of same the Symphony, Just like rhythm and the rhyme. We used to be like trough n crest, Or like fledging of the same nest, Everything was going so fine. What happened in the mean time? We used to be like artery and vein, At the gossamer, it’s all the same, We were interestingly entwined! We were like wings of same bird, Sheep lurking in the same herd, Or just like the bottle and the wine. What happened in the mean time? Now we made our own headways, But if I see the wake of yesterdays, You were the of best pals of mine. Whenever with any shred of doubt, It’s imperative to get it sorted out, Friends are found once in lifetime. Else one thing may hunt you some time, Some thing will haunt you all the time! What happened in the mean time? What is it happened in the mean time?